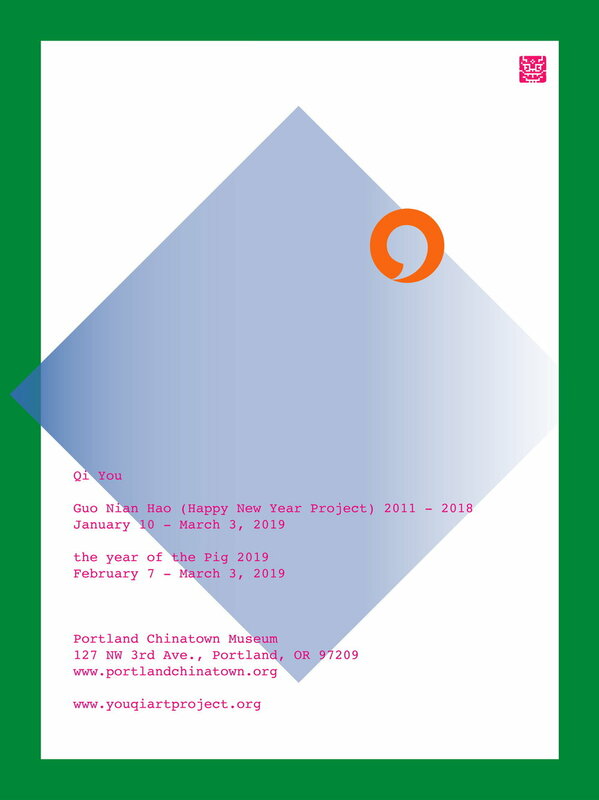 The Portland Chinatown Museum is pleased to ring in the Year of the Pig its latest art exhibition, GUO NIAN HAO (Happy New Year Project) - a series of Chinese zodiac posters by artist You Qi. In China, right before the spring festival, households will hang new year posters on their door for praising happiness for their family. The symbolic pattern decoration on the posters represent peoples’ best wishes for happiness in a traditional cultural way. It is a custom that has been passed down from generation to generation. You Qi’s HAPPY NEW YEAR PROJECT is long-term project that began eight years ago. At its core, it is a series of traditional Chinese new year zodiac sign posters for blessing happiness made right before Chinese New Year. As an exploration of cultural tradition in a postmodern, globalized world, the limitation Qi placed on herself was to create each zodiac sign using only modern logos. The year of the pig posters are also available for sale at the Chinese Lansu Garden gift store. You Qi is an independent artist in Portland, Oregon, originally from Beijing, China. She graduated from China Central Academy of Fine Arts in Design major and finished her MFA in Expanded media program at School of Art and Design, New York State College of Ceramics in Alfred University. Her work has been shown and screened at Anthology Film Archives, NorthWest Film Forum, Seattle Film Institute, New Filmmakers Cooperative (New American Cinema Group), The Cinema Museum, The Streaming Festival, etc. The languages of Qi’s art are not limited to time-based art, printmaking, but also melting into daily moments, as a new form of media, the acts of love.